For the first 45 minutes of our trip through the mammoth, 20,000-square-metre building, we didn’t spot another visitor. Browse places to stay in Siem Reap on Agoda.com. Free cancellation. The museum opened in November 2007, and its shopping mall-like feel contrasts with the thousands-year-old artefacts contained within it. This is the only gallery that’s just one large room, rather than a series of maze-like alcoves, and the sight of all these Buddhas at once is striking. Hundreds of small and miniature Buddha figurines, made of metals, jewels and wood, all individually illuminated, line the walls here, identified according to the period they were made during and where they were discovered. In the centre, life-size and larger Buddha characters are displayed. The display includes Buddhas from Banteay Kdei, Bayon, Angkor Wat and Preah Vihear. This gallery and all the subsequent ones combine mural-size explanations and short films through maze-like rooms explaining Angkorian history. The styles of figurines precede the trademark Angkor style, and there’s a large collection of lingas, lintels and colonnettes. The gallery focuses on King Jayavarman II, Yasovarman I, Soryavarman II and Jayavarman VII, those most responsible for Angkor’s greatest constructions. Figures of the kings and relics from the temples they commissioned abound. There’s a large film gallery inside this section of the museum. It features beautiful, panoramic images of the temple and explanations of how it was constructed. There are also many restored figures from the temple itself as well as post-Angkorian wooden statues used for worship at the temple until several hundred years ago. This room is one of the most interesting. It’s a collection of stone pallets with ancient Khmer and Sanskrit inscriptions. The writing on each slate is explained on placards below. The writing on them includes the declaration of the construction of a new hospital, lists of slave names, mediations of land disputes and adulations of kings and gods. From Apsaras and kings to princesses and warriors, this room contains the busts and statues of distinct fashions and styles as they evolved throughout Angkor time. There’s also a collection of ancient jewellery and headdresses. It’s a clever segue to the final room -- the gift shop -- where upscale imitations of these fashions abound. It’s $12 to enter the museum, plus another $3 if you want to bring in your camera and another $3 for an educational headset. 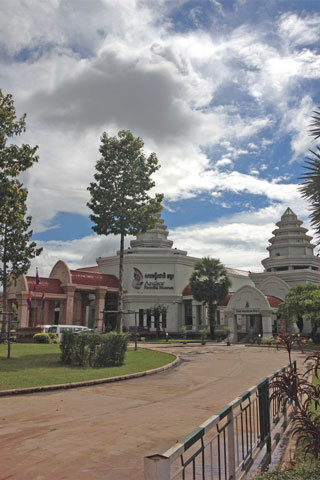 Sadly, like ticketing and management of the Angkor park, the museum is owned and run by a private company, so little of your admission money goes to Cambodia or to temple restoration (though what the company paid for the concession might). Still, it’s perhaps better than these artefacts remaining in the hands of private collectors. A connected mall is still under construction but has a few open stores, including a Blue Pumpkin satellite, several souvenir shops and the sure sign of apocalypse -- a KFC.